It is fairly obvious that buying a small home is going to be a cheaper decision than buying a large home. The total amount of money that you will pay to purchase the home is lower (assuming that the homes are otherwise comparable). Additionally, the smaller size means that you will have lower energy bills so you will save a lot of money on utility bills over time. Less money spent on cleaning. The small home has fewer spaces to keep clean. This makes it a lot less likely that you’ll get overwhelmed by the mess and waste money on a housekeeper service. Even if you would clean a large home by yourself, you’ll spend less on cleaning products for the small home since you’ll need to use fewer of them each time you clean the house. Additionally, you’ll save time on cleaning and time is money for most people. Small homes may lead to lower ongoing medical costs. There are a lot of reasons that small homes may be healthier than large homes. They are easier to keep clean. It is more obvious when there’s a health-threatening problem in the home. People tend to want to get out of small homes rather than hang out in them so they become more active and this improves their health. Plus since small homes are cheaper they reduce financial stress and this can improve general well-being. A healthier person spends less on general medical bills. Small homes have less room for stuff. The more space that you have, the more you feel like you need to spend money on stuff to fill up that home. A home with an extra bedroom almost always has an extra bed in it. A home with an extra bathroom usually has more towels. With a smaller home, you buy less stuff and waste less money on material things. The things you do buy will stare you in the face. Not only does the small home have less room for stuff but it has less storage. As a result, you actually see the items that you’ve purchased every day. This really helps you become aware of your unnecessary home purchases. Over time you’ll reign them in and waste less money. You’ll also be more likely to sell off things you don’t need to keep a small space clutter free. A very small home may not require a building permit. Some people choose to live in extremely tiny homes. These homes are more like travel trailers than real buildings but can be suitable spaces for single folks or frugal couples. You can avoid the costs associated with needing to get building permits if the home you choose is small enough. It’s easier to build a small home by yourself. Even if you do need to get a building permit, you may find that you can significantly reduce the construction costs of a brand new home if you select a small home. That’s because the design of many small homes will be simple enough to do the construction yourself. Modular or pre-fab homes are one way to go but even traditional building may be accomplished by a skilled homeowner when the home is small. The actual material costs will be lower, of course, but the fact that you can do a lot of the building yourself is where you’ll really save money since labor costs are often quite pricey. You can buy less land for a small home. A small home can naturally be placed on a smaller lot of land. This saves you money. Greening a small home is cheaper. A small home obviously saves you money on electricity because it requires less energy to power the home. However, it can also save you money if you decide to go even greener in the future. It’s less expensive to make water-saving, energy-saving updates to a home when the space and appliances you have to work with are limited. This will in turn save you more money on your ongoing energy costs. Maintenance costs are fewer and lower. The less home you have, the less home there is to repair. A smaller roof will cost less to repair down the line than a larger roof, for example. You’ll also spend less time on maintenance and repairs so you’ll have more time to devote to income-generating activities. You gain skills that help you save money. Having a small home improves your decision-making skills. You need to make more thoughtful choices about what you own and how you arrange it. 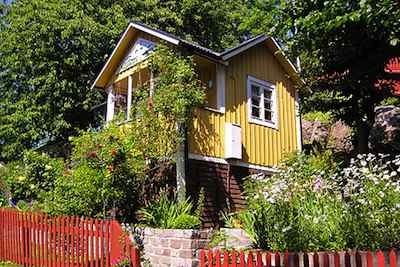 Living in a small home can improve your communication skills since you can’t just walk far away from the other person. These skills can lead to better skills with money as well. Would you still prefer a larger home? Check out our article on key strategies for trading up to a larger home! Would you be willing to live in a smaller home in order to save money? What do you see as the biggest pros and cons? Share your answer in the comments! I couldn’t agree more… Bigger is not always better. I have always preferred a smaller home in a great location versus a larger home out in the middle of nowhere! I like your points about saving as a result of the size of the house. I don’t think many people are building their own homes these days though. Could be wrong. I’m a huge fan of small houses and tree houses, but by husband has a ton of books. We’ll have to live somewhere when he retires (our housing is included with his job.) I offered to build him a “reading room”, he countered by asking for a Kindle. We’ll see what happens…. I never understood why folks with small family units go ahead and buy those 3500 sq ft McMansion monstrosities. And Ray is right; I say what’s the point of having such an expansive home when there are only two — or even five — folks living under the same roof? I know a childless couple (friends of mine, actually) that live in such a home and the home is so large it lacks that “homey” feel that makes a house, well… a home. I grew up in a beautiful, but large house. Since my mom worked, I did a large share of the housecleaning. Although I loved that house, I really appreciate how easy it is to clean my small house and also how much cheaper it is to keep it warm during the winter. I rather live in a big confortable house than a small one even if it cost me more money. You can not always safe your money, and mostly people safe money for their house. That’s funny. The pennies saved on cleaning will not be my motivator. Embarrassing. We have gone through lots of problems when my elder daughter was buying a property. Purchasing a home of our choice was always a night mare for me. But then, the savers mortgage broker and my realtor worked together and helped us with all the financial dealings and it was a proper planning!